Word has reached our group with the passing of Delta Golden Wings member retired Delta pilot Captain Roscoe G. ‘RG’ Elliott, age 93. 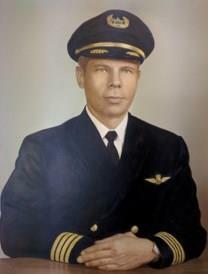 Captain Elliott joined Delta Air Lines 02-27-1946 and retired in 1983 based DFW. He is survived by his wife Louise. Services are planned for tomorrow Thursday, December 8th at 12:30PM. Bluebonnet Hills Funeral Home of Colleyville, Texas has been entrusted with arrangements... (817) 498-5894.....the family invites all to attend. R.G. "Roscoe" Elliott, 93, of Richland Hills passed away on Monday, Dec. 5, 2016. Celebration of life: 12:30 p.m. Thursday at Bluebonnet Hills Memorial Chapel. Memorials: Memorial donations may be made to Richland Hills Baptist Church. Roscoe, as he was lovingly known, was born in Chalybeate, Miss., on Feb. 3, 1923, to parents, Claude and Olen Elliott. He proudly served his country as a pilot with the Army Air Corps and was a World War II and Korean War veteran. He actively served and transported paratroopers to Normandy on D-Day. He later dedicated 37 years of service to Delta Air Lines. He retired in 1983 as the most senior Delta pilot and was captain on the L-1011 TriStar. Roscoe will be remembered as a loving and dedicated husband, father and grandfather. Described as generous and quick-witted, Roscoe leaves great memories amongst the hearts of those who were blessed to know him. Survivors: R.G. is survived by his wife of 70 years, Louise Elliott; daughters, Barbie Adair and husband, Jay, Donna Mowdy and husband, Danny; granddaughter, Shelbi Goodman and husband, Charlie; and extended family and friends. It is with a heavy heart that the family of R.G. "Roscoe" Elliott bears the news of his passing on the afternoon of December 5, 2016. He had been in the hospital for just a few days with relatively minor issues, when things quickly became more serious, with no practical remedy. He died peacefully surrounded by his family. It is an awkward situation trying to notify all of his email friends in a timely fashion, and we deeply apologize if this message has reached you in error. Unfortunately, his email contact list doesn't distinguish between good friends and possible bill collectors. One of the highlights of his day was reading emails from his friends. We will have a small funeral on Thursday, the 8th, at 12:30 p.m. at Bluebonnet Hills Funeral Home, 5725 Colleyville Boulevard, in Colleyville, TX. Any who wish to attend are welcome.